The holiday edition of Sweet Paul Magazine is out now. There's so much fun stuff in there, I can't wait to spend some time with it to see what everyone else has contributed (btw: check out Paul's very clever pendant lamp - I am in love with it). My piece is on cranberries and begins on page 104. Paul wrote the cake recipes and I wrote the sugared cranberry recipe. I adore cranberries and love this time of year when they are available fresh. This year, try dressing your turkey with a raw cranberry "sauce" versus the traditional kind - you will be surprised about how crunch, fresh and flavorful cranberries can be. Paul's version is in the article, and another great, savory one to try from an old post on this blog can be seen here. 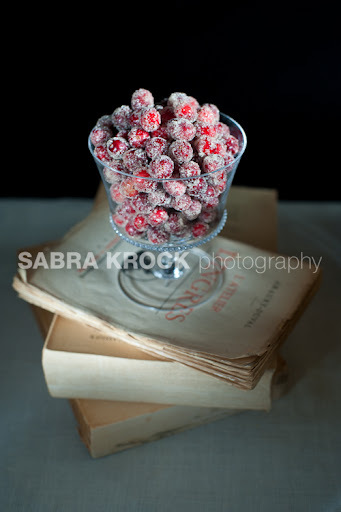 Have you ever tried sugared cranberries? They are a delight to the eyes (the perfect decoration for a cranberry mould or a cheese plate) and a surprise to the tongue - they become completely crunchy like a hard candy. They are a cinch to make - just have them ready no more than a day ahead. Humidity is not their friend. Enjoy! Create simple syrup by heating 2 cups sugar with 2 cups water until sugar is completely dissolved. Allow mixture to cool off-heat for a few minutes so that cranberries won’t pop when simple syrup is poured over them. Put cranberries in a large heat-proof bowl and pout simple syrup over them. Allow to cool completely, cover with plastic wrap and refrigerate overnight. Drain liquid from cranberries. Roll cranberries in sugar (note: one simple way to do this is to pour sugar onto a baking sheet and place a handful of cranberries on sheet and move back and forth to coat. If sugar clumps replace with fresh sugar. Repeat handful by handful until all cranberries are coated. Spread coated cranberries onto two baking sheets and allow to dry for a couple of hours. Sugar will dry and cranberries will turn into a crispy candy. That's a beautiful picture. I like the dark background with the cranberries. Have never had them raw. Is there anything we need to do? Ha! Angela - I realized last night after I went to sleep that I didn't post the recipe! It's there now! They are an eye-popper all right. Enticing and exotic. Can't wait to try them. Beautiful. I love the tattered book the pretty bowl is on top of. Great look. Oh, this photo is SOOOOOO beautiful. I stared at it for 10 minutes (then felt the need to brush my teeth). Yum! Those berries look unreal. How about a hunk of turkey & dressing slathered in thick rich gravy to go with them? Absolutely beautiful photo!